These two elaborate carved pillars are technically pilasters, since full-length portions of two adjacent sides remain uncarved. The Adina mosque at Pandua and the one at Gaur are the two earliest mosques to have survived in Bengal and unlike almost all of their successors they were built of stone. This was almost certainly thanks to the proximity of the Rajmahal hills in Bihar, the only source of stone for Bengal, both for building and for sculpture [see LI894.12]. The decoration consists mostly of flora or abstract motifs, although bunches of grapes (?) as well as bells can be identified. 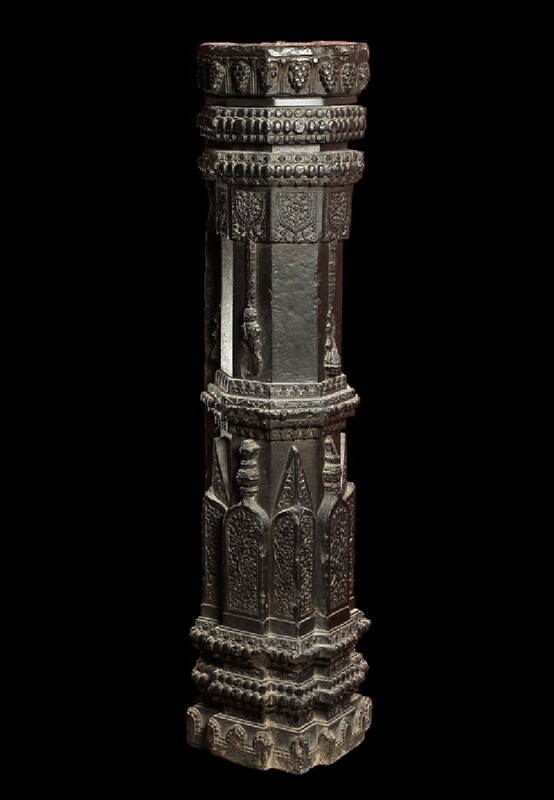 These would be acceptable to Muslims; on the other hand, the general nature of the decoration belongs to the stylistic koine of late North Indian architectural decoration, Hindu ornament having been increasingly formalized to the point of abstraction. The earlier mosques in western India, dating from the 12th century, made extensive use of materials taken from demolished Hindu temples, which raises the interesting possibility that these pillars were originally carved for a Hindu temple and re-used for the Adina Mosque. There are identical pillars in the British Museum and the Royal Scottish Museum.